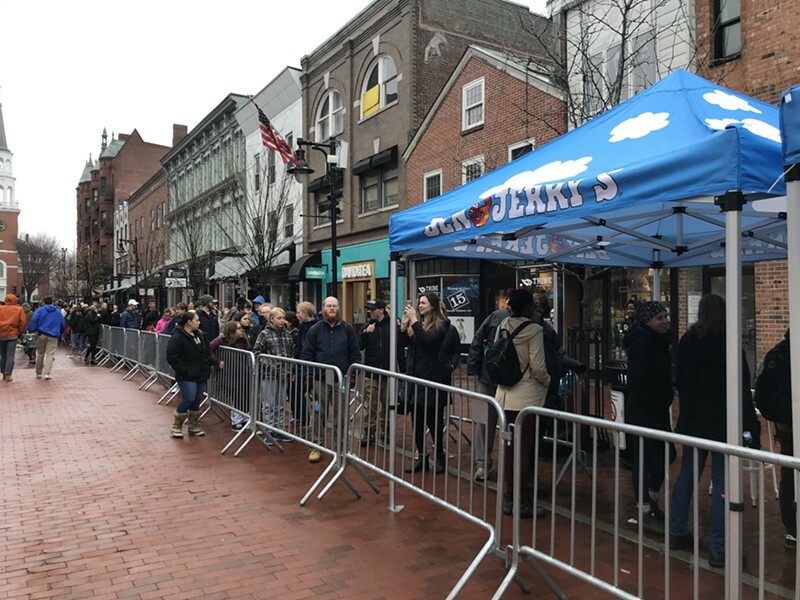 Freezing rain was the topping du jour at Free Cone Day, the annual global event when Ben & Jerry's gives away ice cream cones to celebrate another anniversary. 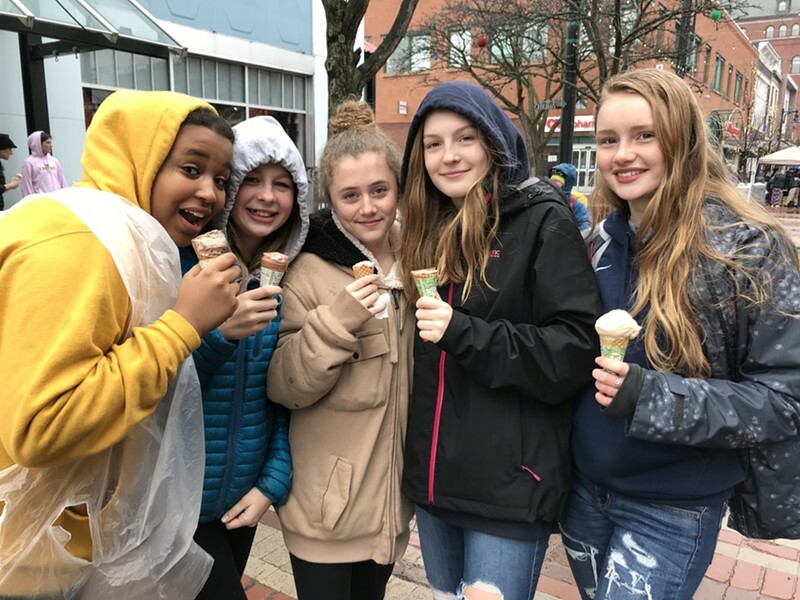 The crowd that gathered Tuesday at about 2 p.m. at the scoop shop on Burlington’s Church Street seemed happy to overlook the weather — 31 degrees and a steady rain — in favor of what awaited at the front of the line. “Chocolate Therapy,” announced Van Stowell, naming the ice cream flavor he intended to order (and its likely effect). A fabricator/sculptor who repurposes found objects, Stowell drove from Fairfax for a free cone, stopping in Essex to pick up a friend. Outdoor Gear Exchange with their cones, trying to stay dry and warm. She and her classmates agreed the ice cream cones were especially worthy on Tuesday, after two hours of standardized testing in the morning. Tuesday marked the 41st annual Free Cone Day. It was started a year after the original ice cream shop opened in a refurbished gas station at the corner of St. Paul and College streets. Founders Ben Cohen and Jerry Greenfield kicked off the tradition in 1979 to celebrate the company's first birthday, said Matthew McCarthy, the company’s current CEO. “They threw open their doors to thank everybody,” he said. 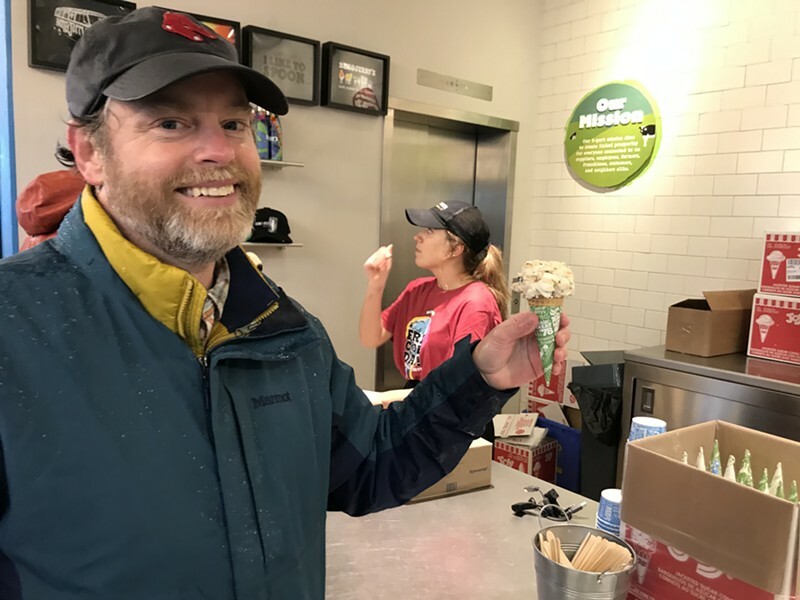 According to Ben & Jerry's "grand poobah of PR" Sean Greenwood, the Burlington scoop shop would give away about 7,000 cones on Tuesday. Out of roughly 600 scoop shops worldwide, most participate in Free Cone Day, he said. McCarthy, 50, became CEO of Ben & Jerry’s last summer. For his first Free Cone Day at the helm of the company, he worked as a scooper. In Waterbury, the most popular flavors he served were vegan chocolate chip and chocolate fudge brownie, McCarthy reported. One man had particular fun at Tuesday's Free Cone Day. Chris Kayhart took the afternoon off from his IT job at UVM Medical Center to set a personal free-cone-eating record. He was on track to put away 11 of them, topping the 10 freebies he consumed each of the past two years. He said the lousy weather worked in his favor because it shortened time spent in the line. Two years ago, when it was slushy and cold out, it took Kayhart two and a half hours to go through the line 10 times for his free cones. Last year, with good weather, the same yield took five and a half hours due to the longer line. This year, Kayhart ate his 10th cone — Americone Dream — two hours and 20 minutes into his marathon, then headed to the end of the line to wait for No. 11. “I knew if I was going to break my own personal record, that it would have to be bad weather,” Kayhart said.